Rooted in the cultural and historical context of Native communities, Native community development financial institutions (CDFIs) are weavers that connect the elements necessary to build thriving local economies. One way this happens is through the Native Gathering Day at the Opportunity Finance Network (OFN) conference. The OFN conference spotlights the CDFI industry, and Native Gathering Day occurs before the conference begins and focuses solely on Native CDFIs. 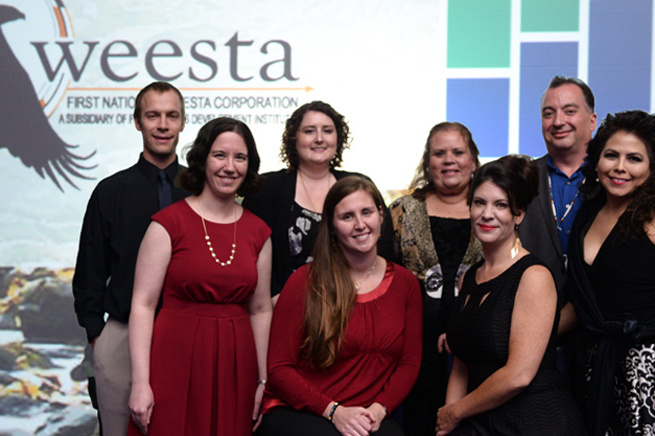 As a Native CDFI intermediary, First Nations Oweesta Corporation offers financial products and development services exclusively to Native CDFIs and Native communities in the Northwest and across the country. They hosted their 12th annual Native Gathering Day in September. This year, the event brought together a network of 100 visionary Native leaders and investors. Oweesta’s presence at the OFN conference also stretches beyond Native Gathering Day. It includes a Native awards ceremony and a track of sessions, focused on Native CDFIs and Native communities, that occur during the conference. Langholz helped our team understand what Oweesta learned and what lessons scholarship recipients walked away with as a result of this year’s Native Gathering Day. #1. COMMUNITY BUILDS THRIVING NATIVE CDFIs. It’s no secret that Native CDFIs are deeply committed to their communities. Yet it’s sometimes challenging for them to reach out beyond their own communities and connect with other CDFIs and financial institutions. Langholz explained that coming together as one Native community is crucial to Oweesta’s network. Sharing wisdom helps build strong Native CDFIs. #2. NATIVE CDFI LEADERS LEAVE WITH STRONGER FINANCIAL AND ORGANIZATIONAL MANAGEMENT SKILLS. Every year, Oweesta surveys Native CDFI leaders before the conference begins. The survey informs a curriculum for Oweesta’s trainings that’s tailored to the varying needs and skill levels of Native CDFI organizations, whether they’re established or emerging. Jonelle Yearout is the executive director of NiMiiPuu Community Development Fund (NCDF), one of many smaller-sized CDFIs. Yearout said she came ready to network and learn. Yearout said she brought home resources to help develop new policies and strengthen NCDF’s financial management operations. #3. NATIVE LEADERS LEARN FROM INVESTORS. Throughout the day, Native CDFI leaders met with funders, investors, and potential investors. Each encounter had positive results. Yearout left with insights about opportunities to link the work she’s advancing at NCDF—or could advance—with funding goals. “Foundations and funders gave insight on work they are promoting and how Native CDFIs are suited for or prepared to fit in their scope,” Yearout explained. As a result of the conference, Aitken said LLFS now is aware of opportunities to apply for funding with Wells Fargo. #4. INVESTORS LEARN FROM NATIVE LEADERS. “The opportunity to be physically present for the Gathering and to have the opportunity to network with other CDFI leaders, advocates, and funders is priceless,” said Megan Teare, senior vice president, Wells Fargo Community Lending & Investment. Teare was among many funders and potential investors who participated in a panel discussion. By offering a slate of helpful events ranging from hands-on workshops to operational advice to personal connections, the conference—especially Native Gathering Day—was a success. And the events at the conference were invaluable for another reason. Langholz said the conference was a chance for the 1,450 attendees to see firsthand how Native CDFIs are supporting the broader Native American movement to enhance the quality of life for Native people. The conference confirmed that by weaving together people, ideas, and possibility, Native CDFIs are connecting the elements necessary to build thriving local economies. And, for this we’re very thankful.